Snakes are charming and mysterious, so it's no wonder that banquet preparations for the Year of the Snake have mysterious problems. Someone keeps sneaking in and eating the foods, and the decorations. Is it the Snake King? Or a cranky Monkey who wishes the banquet were for him? 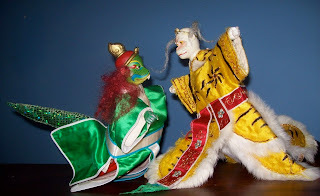 Join Margaret Moody of Galapagos Puppets for this lively episode of Journey to the West, told with traditional Taiwanese hand puppets and choreography. Please stay and make a simple Chinese Zodiac puppet afterward. Try a little oo-long tea, too! This program is supported in part by a grant form the Arlington Cultural Council, a local agency which is supported by the Massachusetts Cultural Council, a state agency.